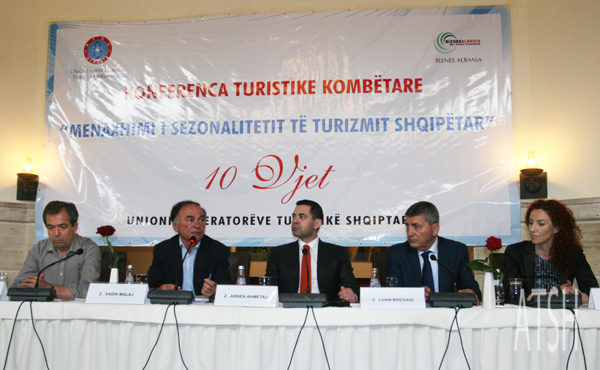 The Albanian Travel Operators Union organized on May 21 a conference on the theme “The Seasonal Management of tourism in Albania”, in the framework of the 10th anniversary of the Union. The conference aimed to point out the potential of the tourism sector in Albania and the experiences of travel operators in developing tourism in the country in the last ten years. Present in the conference were all the representatives of travel agencies in the country, representatives from the Ministry of Economic Development and Tourism, representatives from several embassies to Tirana and many other representatives from institutions related to the tourism sector. During the conference, the specialists in the tourism field held discussions regarding the competitive prices that touristic operators offer to tourists, the quality of services byHOTELS AND restaurants in touristic points, the bio Albanian food served in restaurants, ect. Another point discussed was the development of the agro tourism and the rural tourism as very important for increasing the economy in rural areas of the country. The conference aimed to highlight the numerous opportunities that tourism sector offers for local and foreign tourists as rafting, hiking and trekking in the northern touristic villages and national parks, the winter tourism and the stunning beaches of the Albanian Riviera. The conference was organized with the support of the Biznes Albania association, the National Agency of Tourism and the Council of Albanian Agro Tourism.